Crystal Lim in Television on 4 March, 2016. 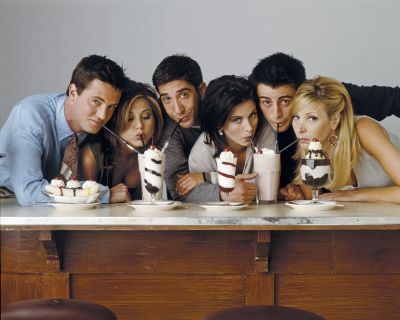 The universal appeal of Friends – who doesn’t enjoy a good milkshake? With the recent screening of the reunion of the cast of Friends, I have been inspired to watch the series again (despite having watched it about 70 times). It’s amazing how I laughed at every episode like I did the very, very first time I saw them. Of course, I know how the story goes – Ross likes Rachel, they date, they break up, and then it is on and off – and halfway through the story Monica and Chandler get together, Phoebe’s weird and Joey’s flirty. There is an undeniable legacy that Friends left behind that just leaves people saying, man, that was a great show. My favourite episode has to be The One Where No One’s Ready. You can see the panic in Ross’s eyes when only one of his five friends is ready, and that is made worse when Joey and Chandler decide to fool around with the sofa and Rachel subsequently decides she isn’t going to go. It is so, so hilarious and I can relate to it even more now that it is summative season, when it feels like I have too much work and not enough time. I feel ya, Ross. Favourite episode aside, what makes Friends such a great show? Is it the constant jokes about Ross’s three divorces? Is it Joey’s cheeky “how you doin’”? Or is it the way Chandler speaks? To be fair, I don’t quite think it’s any of the above. Obviously they all played a part – but what I think made Friends such an incredible show is the fact that it’s so relatable. And it’s not that just one character is relatable, it’s that they all are in many, many different ways. I can’t say personally that I’m most like a certain character – because I’m not. I’m not as uptight about cleanliness as Monica is – you’d understand if you see my room – but I most certainly am as stubborn as she is. I have my own way of doing things, and I don’t like it when people question it. In the same way, I’m not funny like Chandler, but I do have someone I love with all my heart, and I would want to spend my whole life making sure they feel as happy as I am. I think the satisfaction mostly comes from watching the characters grow. And perhaps because you see a little bit of them in yourself, you hope to someday be like them and grow into the person that you want to be (not to mention the million-dollar paycheck). You look at the characters in Season 9 and think back on those same characters in Season 1 and think, oh my, they have come a long way. And you then think to yourself, wow, they’ve got it all together. And you tell yourself, I will be like them one day. One other thing about Friends is that everything always work out. When Chandler kissed Kathy and Joey wouldn’t speak to him, I thought, oh man, this is it. This is the end of Joey and Chandler. How is Chandler ever going to get out of that? Well, as it turns out, the answer is he gets into a box. But I digress. Friends has given me a sense of optimism, that even when “things are Lapoo right now”, it’ll all be okay in the end. That not only are things going to be fine, they are going to be so much better than you expected. In a weird way, Friends restores my faith in humanity just a little bit. As much as Friends is a sitcom with brilliant, brilliant jokes, I think it is a lot more than “just a sitcom”. I think it gives us hope, and to some extent, it gives us the courage to keep pushing, to keep going, because if Rachel can get out of her comfort zone and cut up all her credit cards and eventually end up working in Ralph Lauren, surely we can work our way out of whatever difficulties we are in. Interviews with the writers and producers proved a common point: that life is unpredictable. You never know what to expect, but you give it your all anyway. When they pitched the show to NBC, they didn’t know that it was going to be such a big hit, and they certainly didn’t know that it was going to be one of the biggest hits, one of the landmark shows that American TV has ever known – but that did not stop the writers from putting everything they had into every episode. With every episode comes constant writing and rewriting and everyone putting their heads together to make sure that every episode was the best version of Friends, and if that means anything at all, I think it’s pretty incredible. Symbolism aside, amidst the busy block deadlines and summative season, re-watching Friends is like a temporary relief from what is otherwise a very hectic couple of weeks. After all, Friends will always be there for us, won’t it?